2015 was our best year ever and we just finished up a huge project delivering air purifiers for the local gas company. The air purifiers were delivered to residents of Aliso Canyon near Los Angeles. The natural gas leak found there was rated as the worst man-made greenhouse gas disaster in history by the Washington Post. Our team hustled for months to help improve resident's air quality through equipment fulfillment and deliveries in the entire region. Earlier this year due to our crush of business we were not accepting new customers, but now with all the air purifier deliveries completed, we are now accepting new clients. When you have a fulfillment or logistics need, Medallion Fulfillment & Logistics is here to provide custom solutions for your needs just like we did for the gas company, just ask us! Most ecommerce companies are surprised by how little third-party fulfillment costs, particularly when compared to how much they already spend to warehouse, package, and ship their own products. Outsourcing order fulfillment is cost effective and allows you to switch variable costs to fixed costs. Gene Kent, President of Medallion Fulfillment & Logistics said, "Many times companies are surprised at the overall cost savings our services have supplied when they review their bottom-line after the first six months. As we have heavily invested in technology, both in order processing and bar coding in our warehouse, we are able to process orders faster and cheaper than you can typically do yourself." A high quality order fulfillment company satisfies customers which lead to repeat business. 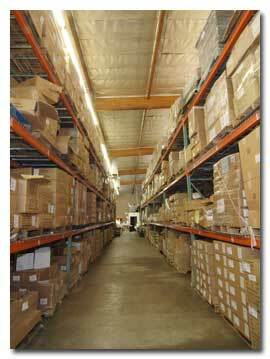 "Our warehouse bar coding system eliminates problems. When customer merchandise is received in our warehouse it is immediately bar coded and entered into inventory. Handheld scanners are used by our packers and your inventory is tracked all the way to order shipping. We are using one of the most technologically advanced order and inventory management systems allowing business owners to review stock and order statuses of items on our system 24/7 from anywhere in the world just by using the Internet." said Gene Kent. As your company expands, a fulfillment company can handle your wholesale or B2B orders. Wholesale orders from large retail chains, catalogs and other mass merchants have different demands than business-to-consumer orders. The penalty for noncompliance with an order from a chain of retail stores for even something trivial, can be costly. Fulfillment houses routinely work with wholesale orders and can develop order processing checklists for your account to assure that your orders are completed based on the requirements of the wholesaler; saving you costly charge backs. Many nationally known companies reap the benefits of partnering with a third party fulfillment center. Small, medium and large businesses can do the same. With 29 years as a fulfillment service provider, Medallion Fulfillment & Logistics understands your culture, brand, and products from a depth of real world experience. Jan Stewart is a professional writer for Medallion Fulfillment & Logistics, a family owned Los Angeles based fulfillment firm. She writes exclusively for the Medallion Fulfillment & Logistics newsletter on topics of business tips, how to promote your business online, and establishing your brand in the marketplace. With warehouse space newly available at our Chatsworth, California facility we are now actively looking to add to our client-base.